Over the past week, nearly a year after he tried to have Robert Mueller fired, Donald Trump went on a tweeting rampage against the special counsel. Trump’s escalating Twitter attacks may be a harbinger of Mueller’s impending dismissal — or the president could be trying to preemptively discredit and delegitimize Mueller’s eventual findings against him. But Mueller’s investigation shows no signs of abating. He continues to secure grand jury indictments, as well as plea bargains that make those pleading guilty into cooperating witnesses. And now he has subpoenaed financial records of the Trump Organization. Although the Department of Justice regulation empowers the Attorney General to appoint a special counsel, that task fell to Acting Attorney General Rod Rosenstein last year, since Attorney General Jeff Sessions recused himself from the Russia investigation. Trump cannot personally fire Mueller. He could order Rosenstein to do it, and if Rosenstein refuses, Trump could fire Rosenstein or force his resignation. Since Associate Attorney General Rachel Brand is about to retire, the next person in line who could fire Mueller would be Solicitor General Noel Francisco, a right-winger with ties to the conservative Federalist Society. Francisco may be amenable to giving Mueller the axe. Last July, Trump told the Times that Mueller would cross a “red line” if he investigated any Trump business unrelated to Russia. 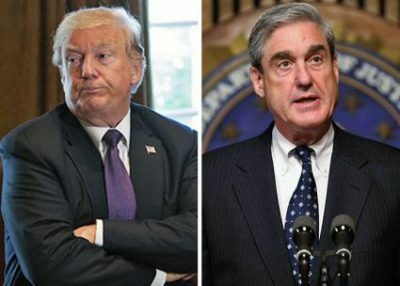 A few days after the subpoenas were served, Trump’s lawyers met with Mueller’s team “and received more details about how the special counsel is approaching the investigation, including the scope of his interest in the Trump Organization,” the Times reported. First, it is seeking information as to whether Trump or his campaign worked with Russia to help Trump win the election. Second, it is looking into whether Trump or his advisers engaged in obstruction of justice to end the investigation. And third, it is investigating a possible quid pro quo that Trump and family members, particularly son-in-law Jared Kushner, may have sought in return for political favors, such as lifting sanctions on Russia or altering US policy on the Ukraine. Trump apparently forgot that Mueller, the head of the team, is a long-time Republican. Dershowitz apparently failed to read the regulation, which does not require probable cause of criminal activity at the time a special counsel is appointed. After appointment, the counsel’s investigation may or may not uncover evidence amounting to probable cause, which is the standard for the filing of criminal charges. Dowd first said he was speaking on behalf of the president, but later backtracked and said he was speaking for himself. He resigned a few days later, saying the president wasn’t following his advice. But Trump just hired attorney Joseph diGenova, who has publicly accused the FBI and Justice Department of “trying to frame” the president, a claim that likely endears him to Trump. Democrats fear that Trump might set the wheels in motion to fire Mueller during the forthcoming two-week congressional spring break. Eight months ago, legislators introduced two bipartisan bills to subject a president’s order to fire a special counsel to judicial review. But Republican lawmakers are not promoting the legislation, which is now stalled in the Senate Judiciary Committee. Although some Republicans have questioned the constitutionality of the legislation, those concerns are without merit, and are more likely motivated by political considerations. GOP lawmakers know that any bill they pass to protect Mueller would require Trump’s signature and they would have to override his veto. Republicans are more likely “making a counterintuitive, all-in bet that Donald Trump will save their 51-49 majority” in the Senate, according to Politico. They expect Trump to actively campaign for Republican incumbents as well as challengers. “If they’re going to run with him, how are they also going to stand up to him when he precipitates a constitutional crisis? The answer is that they’re not,” Michael Tomasky wrote in the Daily Beast. A special counsel cannot be removed absent good cause under the Justice Department regulation. But without protective legislation, there could be no review of a meritless decision by Trump to dismiss Mueller. What consequences, if any, could Trump face if the special counsel finds evidence of criminal activity by the president? Mueller could deliver his findings to the House of Representatives for consideration of impeachment. But that body, with its Republican majority, will not likely entertain any discussion of impeachment, particularly because Trump is dutifully fulfilling their agenda of tax cuts for the rich and the appointment of a right-wing Supreme Court justice and lower federal court judges. Whether or not a sitting president can be criminally indicted is a matter of controversy. Moreover, diGenova once argued in a Wall Street Journal column that a president could be constitutionally indicted. “It would teach the valuable civics lesson that no one is above the law,” diGenova wrote during the Clinton investigation. Jonathan Turley, writing in The Washington Post, examined the arguments for and against indicting a sitting president and concluded he could be indicted. It is unclear whether a president can pardon himself, but Turley thinks Trump would be impeached if he were to pardon himself. A Preemptive Strike by Trump? Trump is notorious for relying on his own instincts rather than the advice of counsel, such as whether to congratulate Russian President Vladimir Putin on his election victory. But Trump is apparently aware of the risks entailed by engineering Mueller’s departure. The bottom line is that we may never see Mueller’s findings unless he persuades a grand jury to return an indictment against Trump. If Mueller’s conclusions do become public, Trump is likely counting on his preemptive campaign of delegitimization in order to escape criminal accountability. Marjorie Cohn is professor emerita at Thomas Jefferson School of Law, former president of the National Lawyers Guild, deputy secretary general of the International Association of Democratic Lawyers and an advisory board member of Veterans for Peace. The second, updated edition of her book, Drones and Targeted Killing: Legal, Moral, and Geopolitical Issues, was published in November. Visit her website: MarjorieCohn.com. Follow her on Twitter: @MarjorieCohn.